Nope. There was one jar left on the shelves in the basement. 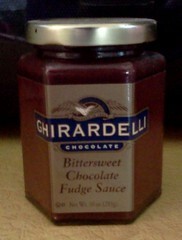 This is, officially, the last jar of chocolate sauce purchased last year for Carole and David's wedding. Once this is gone, I will actually have to buy some from the store. With the root beer gone, I have extra vanilla ice cream to use up before it gets that crystal stuff on it. I have had some with whipped cream and a cherry, but it's so much better with chocolate sauce. As it's the end of the month, I thought this would have to go on the grocery list. While taking stock of the boxes of pasta, I found this behind the farfalle. Ever had chocolate covered pear slices? You slice a pear and warm the sauce. Then drizzle the sauce over the pears. Simple. If you get the biggest size pears you can, use an apple corer to remove the core and seeds. Peel the pear. Sit the pear upright on a plate. Put softened ice cream in the center hole and drizzle warmed chocolate sauce over the pear. Serve immediately. You can substitute whipped cream in the center hole too. I remember, a long time ago, Baskin Robbins made a pear flavored ice cream. I made this pear dessert with that ice cream in the center. It was divine. Hmmmm. I haven't been to a Baskin Robbins in ages. Wonder what 31 flavors they have now? Excuse me. I need some ice cream with chocolate sauce. They actually have 50 flavors listed. I guess you just have to check it out locally. Did not see any pear, though.